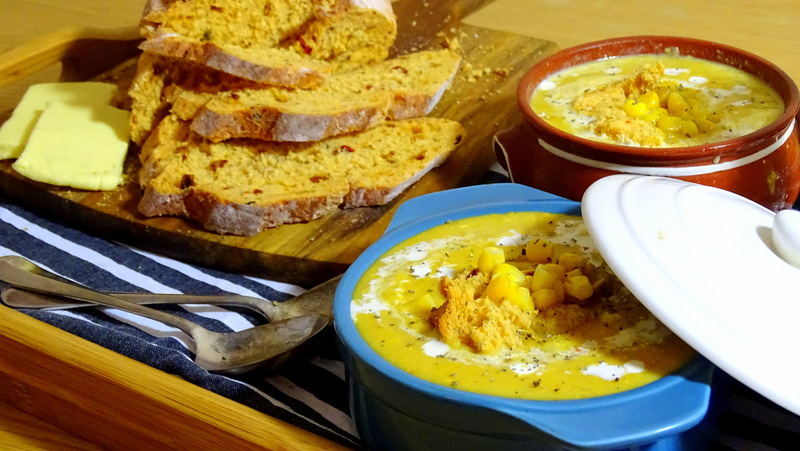 This soup is deliciously filling, the potato and sweetcorn melding together into a velvety, creamy spoonful. The sweetcorn itself packs a huge amount of flavour – almost buttery in its decadence. All in all this makes a wonderful starter on its own, or main served with some dipping bread and a salad. Quarter your potatoes and fry over a medium heat in a few spoonsfuls of butter with some salt and pepper. Cover, but stir occasionally. Should take about 10 minutes. Slice and dice your carrot, onion and leek and add to the pan with a pinch more salt. Again, cover, but stir occasionally. You want the onions and leeks to be soft and beginning to caramelise from the heat below and the steam in the pan. Add all but a few tbsp of sweetcorn to the pan along with a few spoonfuls of sage (or similar). Cover with vegetable stock and simmer for a further 10 minutes or so, with the lid on. Either use an immersion stick blender, or cool and blend upright. Either way, blend the soup until smooth. Add the last of the sweetcorn, stir through half a cup of single cream, taste and adjust seasoning. Garnish with a final drizzle of cream and some more herbage. Posted in Guesscipes, One Pot, Sides and Snacks, Starters, VegetarianTagged autumn, healthy, potato, side dish, soup, starter, sweetcorn, vegetables, Vegetarian, warm, winterBookmark the permalink.